After the success of Blog Number 8, "9 Easy Steps to Silk-screen Printing on Glass", I've decided to post a more detailed step-by-step posting titled "Shortcuts for Silk-screen Printing on Glass." I will specifically talking about how I cut and print on glass, using visuals from a work in progress. With all my work I first design the work and print it full size to use as a "cartoon" to cut the glass to fit. Cartoon is basically the paper printout pattern of the design. Like a large jigsaw puzzle, all the glass should fit together as close as possible on top of the cartoon. and the color printout "cartoon" pattern underneath. To cut glass precisely, I use a glass cutter and flat nose pliers to grind the edge of the glass. I also use a ring saw to cut intricate concave shapes only when needed. I skip using any wet glass grinders, they waste time and slow the process down. Cutting Bullseye glass in the Taurus Ring Saw. Remember push very slowly with this machine, to prevent jamming. When making a silk-screen save the original acetate image. 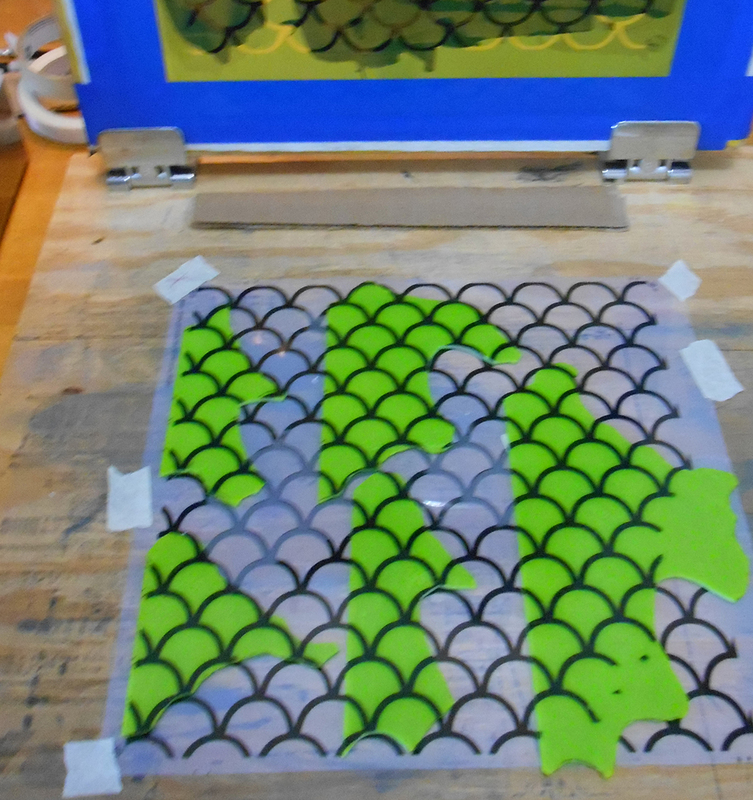 I tape this acetate onto the silk-screen board, and tape the cut glass down on top. Place your glass in the exact positioning you need. I add tape to the back of other pieces of glass and tape them down as well. I order all of my silk-screens through Standard Silk-Screen in New York. Once I have the glass pieces under the screen, I use the best water based enamel on earth, produced by ColorLine (you guessed it, I love this stuff). I only add the enamel above the glass pieces, and not in areas where their is no glass underneath, so when I "pull the enamel" with the squeegee, I also save on materials. To see the steps for silk-screening please visit Blog 8. Notice the bottom right didn't print perfectly. Since the glass is taped down and I was using clamps to hold the silk-screen in place, I was easily able do another print in this area. (right) My favorite "clamshell" Paragon kiln. Place as many pieces of glass on the kiln shelf as you can, then bake. ColorLine enamels bake at 1300 degrees in a "polish firing" where only the surface layer of enamel is permanently baked onto the glass. This kiln fired enamel method dates to Medieval times. If you are interested in taking a class for all or some of these process, please visit "Classes". I offer private classes on all these techniques, marketing advice for artists, and career counseling in my Manhattan Studio or online with Skype. Just email me. OTHER SILKSCREENING SHORTCUTS ON GLASS ADVICE HERE.